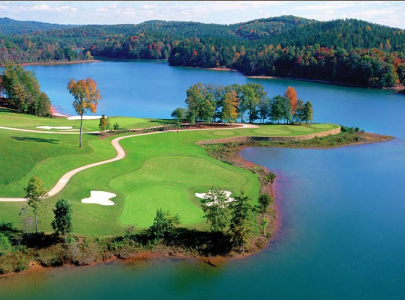 The Web.com Tour’s 2016 BMW Charity Pro-Am presented by SYNNEX Corporation will take place this week at three golf courses including Jack Nicklaus-designed The Reserve at Lake Keowee in Keowee, S.C. Other participating area courses are the Thornblade Club in Greer and The Preserve at Verdae Greenville. The tournament airs today through Sunday from 7:00 p.m. to 9:00 p.m. ET on Golf Channel. The BMW Charity Pro-Am is the only tournament on the Web.com Tour where amateurs and celebrities are grouped with Web.com Tour professionals in a four-day better-ball competition over three courses. Amateurs, celebrities and pros rotate between three courses today, Friday and Saturday, with the 10 lowest scoring pro-amateur teams, six lowest scoring pro-celebrity teams and the lowest 65 pros (and ties) advancing to play Sunday’s final round. Celebrities play once at each course on Thursday, Friday and Saturday. The Professional winner of the overall 72-hole event will take home $121,500 from the total purse of $675,000. Joining in the competition are 27 celebrities ranging from sports to entertainment and music, including seven first-time participants. This year’s celebrity field includes: Black; former Atlanta braves pitcher Jose Alvarez; Hootie and the Blowfish band members Mark Bryan and Dean Felber; actor Andy Buckley; musician Javier Colon; Sister Hazel guitarist Drew Copeland; Rascal Flatts band members Jay DeMarcus and Joe Don Rooney; actress Debbe Dunning; comedian Bill Engvall; actor Dennis Haysbert; actor Oliver Hudson; Olympic gold medalist Dan Jansen; former major-league baseball outfielder and NFL safety Brian Jordan; actor Richard Karn; 2015 Miss America Kira Kazantsev; actor Danny Masterson; actor Jordan Masterson; two-time Super Bowl winning quarterback Jim McMahon; clothing designer Lisa O’Hurley; former MLB pitcher Russ Ortiz; actor Michael Pena; actor Alfonso Riberio; actor Grand Show; actor/comedian Gary Valentine; and actor Tom Welling. Nestled in the rolling foothills of the Blue Ridge Mountains, along the northern shores of pristine Lake Keowee, sits The Reserve at Lake Keowee—a private community with a unique closeness. Among the amenities is the Jack Nicklaus Signature Golf Course, ranked in Golf Digest’s 2015-2016 list of the Best Golf Courses in Each State; a Best Residential –Next 100 choice in Golfweek for 2016; and also, in addition to the golf, ranked “Best for Boating” in Links Magazine’s Real Estate Issue in 2015. The 2015 BMW Charity Pro-Am generated $758,985 in charitable donations. Since 2001, the tournament has generated and distributed over $11.5 million to more than 200 charities.